On Monday, Nov. 26, 2018, Mozambique officially welcomed a specialized team of detection dogs and their handlers to Maputo. The new unit has been established to enhance law enforcement activities at critical points along the country’s most notorious trafficking routes. Mozambique’s rich wildlife and other natural resources are key to the country’s sustainable development. However, with rich wildlife resources and proximity to South Africa’s largest rhino stronghold, Kruger National Park, Mozambique has been targeted and successfully infiltrated by criminal syndicates focused on wildlife crime. These syndicates exploit the country’s port and road networks for the trafficking of wildlife products and Mozambique has become an established export route to consumer countries in Asia. Responding to this Peace Parks Foundation (PPF) has partnered with the African Wildlife Foundation (AWF) to support Mozambique’s National Administration of Conservation Areas (ANAC), in establishing and operating a specialized detection dog unit. This unit will deploy multiple specially trained detection dog teams with skilled handlers and carefully selected dogs that have, since birth, undergone intensive training to detect the smallest amounts of wildlife contraband, like ivory, rhino horn dust, and pangolin scales. Six local handlers — four men and two women — have undergone training in Tanzania, under AWF’s Canines for Conservation Program, whilst accommodation for staff, their dogs, and associated operational infrastructure have been put in place to support the unit’s operations. In addition, ANAC have collaborated with airport and border authorities to ensure operational procedures for the integration of detection dog activities at these areas are in place. 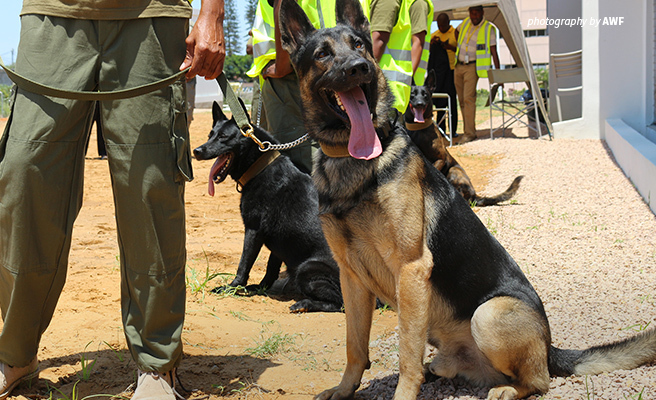 By 2020 the project will have deployed multiple specially trained detection dog teams, with skilled handlers, at various trafficking hotspots throughout Mozambique. This is expected to have an immediate impact on the disruption of trafficking activities, retrieval of illegal wildlife products, and the rapid apprehension of traffickers.